I did it! I completed 50,000 words during the month of November. Well done to all of you who have done the same and to those of you struggling to finish…stop watching tv, reading a book or goofing off on Facebook. Write! Now…my thoughts on this journey for those of you who haven’t attempted this feat yet. Editing…yeah I still have to do it as I go! Word counter how I love to hate you! The feeling you get when you know you’ve reached your goal…PRICELESS! 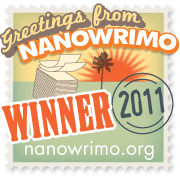 For those of you who have never given Nano a try I highly suggest you do so next year. Many people look at the 50,000 word mark and convince themselves they can’t do it. Trust me…it can be done but it takes a lot of effort, time management and a good idea. do my “I did it” dance again!